Samsung brewing a Galaxy S III Mini? There is no doubt that the Samsung Galaxy S III is the king of smartphones to date with sales margining over 20 Million units and counting. However, arch-rival Apple had just dropped the bomb with the latest iPhone 5 release pushing the sales to 5 Million in the first weekend of release. Likewise, the anticipation of the miniature iPad has been nailing the spotlight to the Cupertino giant. However, Samsung is rumored to counter-attack with the smaller Galaxy S III that is slated to have the same amazing specs inside a more compact device. 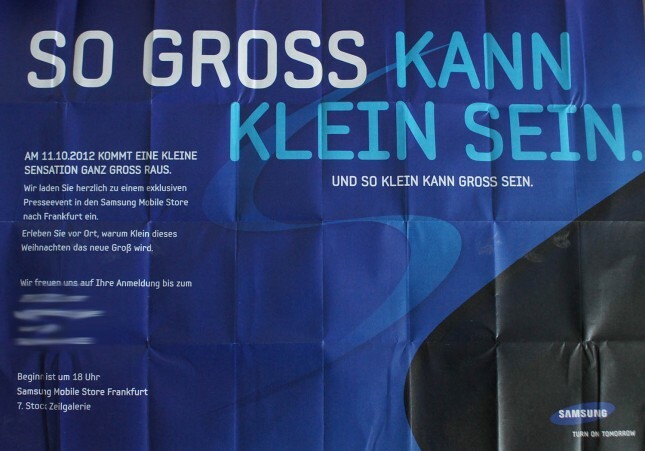 Samsung Electronics is pegged to release the Galaxy S III Mini on October 11th in Germany basing on the invitation that AllAboutSamsung has gathered. As you can see in the alleged invitation, the famous Galaxy “S” line logo with a “small is now a big hit” tagline has been ringing bells to android fanatics. They definitely suggest that one of the biggest brands of the company is about to be revamped. I personally think that the having a smaller Galaxy S III is somewhat off the beat. Having in mind that the Samsung flagship simply has a 4.8-inch screen makes it fit in the middle of the bandwagon (compared to other bigger slates). The “Mini” moniker, however, could denote lesser price point with some of the specs being sacrificed. With these facts being laid out to the rest of the world, what could a potential Samsung consumer think of this lead? How about you, what do you think? Hit us in the same comment box below. Pinoy Metro Geek: Samsung brewing a Galaxy S III Mini?